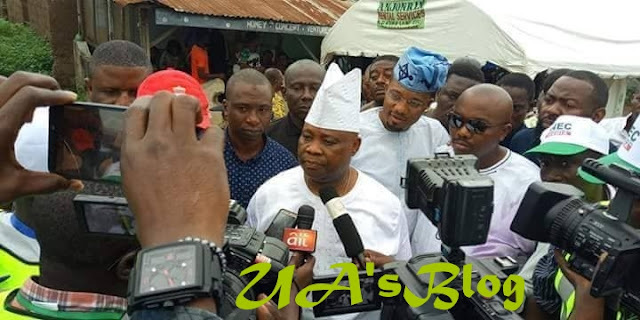 Senator Ademola Adeleke, the candidate of the Peoples Democratic Party, PDP, in the governorship election in Osun State has told the Independent National Electoral Commission, INEC, to declare him winner of the election now. Adeleke accused INEC of working with security agents to announce the candidate of the All Progressives Congress, APC Gboyega Oyetola winner. Adeleke, who spoke with reporters in Osogbo, the Osun State capital, cited irregularities, malpractices and constitutional breaches in the ongoing re-run. His words, “This is not a free and fair election. Osun state is under siege; we are at war in Osun. They didn’t allow my party to vote. “It’s only APC people they allowed to vote. INEC and security agents have compromised. So, there is no election in Osun today.